I really appreciate all of the comments I received on the posts I had scheduled to go up while I was away last week. It will take me a few days to get back to everyone who had questions and to catch up on all the email and blog reading, but I'll get there. Since I can't write a post without a picture... 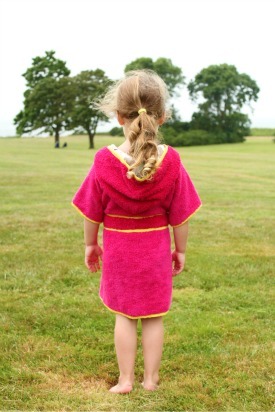 I haven't shared the MADE beach robes that I sewed for the girls, so here's a peek at my oldest's. I'll share more pics of these soon. I also want to remind everyone that this month's Point of View reveal is this Friday, August 26th. The theme is "Back to School", so dust off those old back to school posts or make something new and get ready to join the Point of View Back to School Link Party on Friday. Hope to see you there! Welcome back! I decided to make a new schedule too. It is so easy for me to "lose" a few hours of just sitting here browsing. As I type the laundry is washing and I am getting a good start. hey gwenny! love that robe, and yes, post when you have time, it's good to step back from the computer and into real life, I know I need it! Yay for a trip to Maine. It sounds wonderful. I have to admit Maine is one of the places on my list of "I hope I get to go there some day." I really relate with trying to find a balance of blogging and life. I am always having to reevaluate too. It is a hard balance if you ask me :) Love your darling MADE robes. Welcome back! Sounds like a wonderful vacation. I love Maine. I have been on two camping trips. Once on an unforgettable rafting trip there on the kennebac (sp?) river years ago and another when we spent our first anniversary camping in Kennebunkport. Such a special place. I love that bathrobe. A girfriend of mine made one for a camping trip and it was really handy. Wow cute robe! Glad you had a nice break and vacation! We go away soon, right before school starts...cannot wait!